“Show me,” he demanded a little gruffly. She’d never been shy a day in her life, so why did it suddenly seem like her face would burst into flames at the thought that she was next to him wearing no more than a bathrobe, and about to show some skin to him? She hadn’t worn anything more than her feathers all day, and yet she suddenly felt very exposed. She wove her feathers close to her skin in a simple white bra, then slipped her arm out of the bathrobe, keeping the garment draped around her. The washcloth fell off when she retracted the feather. Idris caught it and whistled softly. He nodded at her answer, although it seemed to be more for himself than for her. With sharp, practiced gestures, he tore a package of sterile gauze and set it over the wound, holding it there with two fingers as he secured a bandage over it. Every time his fingertips brushed against her skin, more goose bumps erupted in their wake. She thought at first the elusive touches were accidental, but she soon noticed the little smile he sported, and how every caress—since it now seemed obvious that was what they were—was a little longer than the last. “You’ve done this before,” she said, and couldn’t quite prevent her voice from shaking a little. His smile turned positively devious as he finished securing the bandage. On the last words, he leaned a little closer so that his mouth was just a breath away from Violet’s. She didn’t know whether to look at his mouth or his eyes. Reflexively, she licked her lips. At the same moment, he pressed forward and covered her mouth. It was just as unexpected as the kiss he’d offered her back in the diner, but she reacted the same way she had then. She kissed him back, and felt him grin against her mouth. He cupped the back of her head and guided her down onto the bed. He laid against her, careful not to jostle the shoulder he’d just treated. Abandoning her lips, he kissed the corner of her mouth then her chin on his way to her neck. She raked her fingers over his head. As short as his hair was, it still felt like silk under her fingertips, and she couldn’t help but wonder what he would look like once it grew back. Heat radiated from his lips everywhere they touched her skin. She sighed deeply and allowed him to explore as he wished, going from her shoulder to her neck, then down to her cleavage. She wasn’t usually so passive, but this felt new. If he’d known like she did that they were destined by fate, the gods, or whatever else to be together, would he have acted any differently? Few people could tell the difference… not that she let many people that close to begin with. “Part of me,” she confirmed, and just because she could she transformed the feathers so that the bra turned black, so thin and translucent it was see-through. Idris made a little appreciative noise. He lifted his head to meet her gaze, and she shivered at the fiery heat she saw there. He looked like he wanted to consume her alive… and who was she to protest, really? She gave him the sultriest look she could manage in that moment… but damn if it wasn’t hard when she was so nervous about being with her mate for the first time. Nervous! Her! She couldn’t recall being nervous ever before. Did he have any idea what he was doing to her? 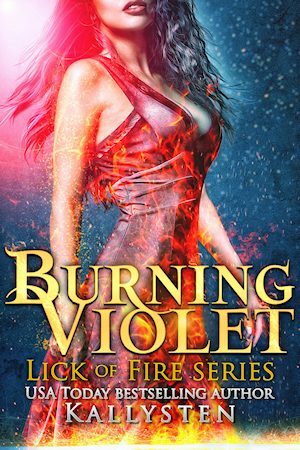 He licked his lips and chuckled, the sound so low it seemed to reverberate down to the very core of Violet’s belly. He didn’t get to finish.